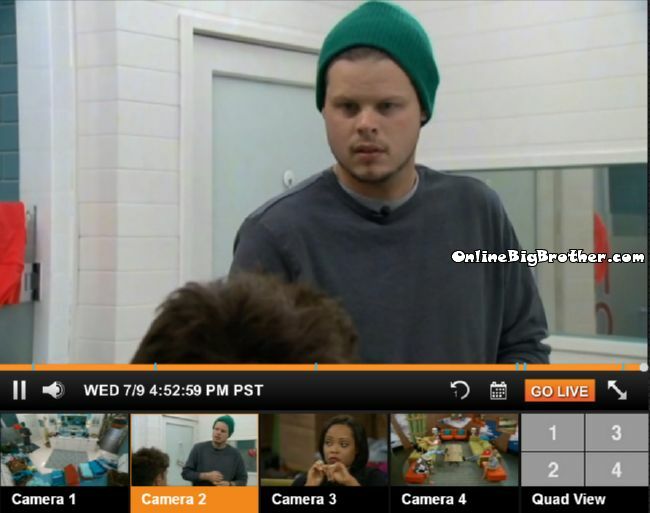 Derrick tells him Devin went Straight rat and is now trying to flip the house to get Zach out. Derrick saying they have 7 votes locked. As long as Devin doesn’t win the POV he’s going home next week. Frankie rolls through says everyone is fine they have the votes to keep Zach. Derrick tells Donny week one there was never a group setting where they wanted to get Donny out. Donny says the core four Caleb, Devin, Amber and Frankie have a final 4. He thinks that alliance is still strong and what they are doing right now is an act. 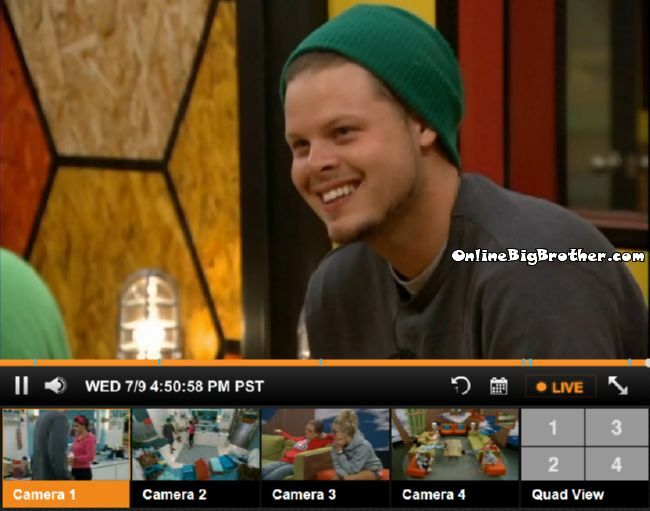 Derrick tells him Devin or Caleb are going home if he wins HOH. Donny thinks they need Caleb gone to break 2 alliances. Donny asks him what they do if they make a play to get out Caleb/Devin/Amber and Frankie doesn’t want to. Derrick doesn’t know says they may have to make a move without him. Donny points out Devin is very paranoid but Frankie isn’t because he’s getting all the information from them and Caleb is getting information from Amber. Donny says Amber always walks in on conversations. Derrick thinks Frankie won’t blow up Team America. donny agrees but adds that Frankie isn’t going to jeopardize his ‘powerhouse’ alliance. They agree to only talk Team America stuff with Frankie. Donny mentions how Frankie knew that Devin talked to him last night but Donny never told anyone. They chat about the team America tasks Derrick is really excited about it because it will give him a fun “Side Game” to play (LOL) POWPOW comes in Derrick says he’s certain tomorrow is going to be endurance. Going over the nutrional information for the Have Nots Slop. Brittany doesn’t trust Devin so she doesn’t know if he’s telling the truth. She does believe they did start an alliance but doesn’t know if she believes the details Devin is saying. Nicole – The thing that bothers me is it would still have bene a secret if Zach was never on the block. Brittany says if they (Bombsquad) continue with their alliance and they are still strong they will eliminate them all one by one.. they have to start figuring out how to break them down but they don’t have the numbers. Brittany starts talking about her kids and how much she misses them. Brittany says she wants to make sure theres a target in the house because she has a feeling that Caleb and Devin will keep putting her up. 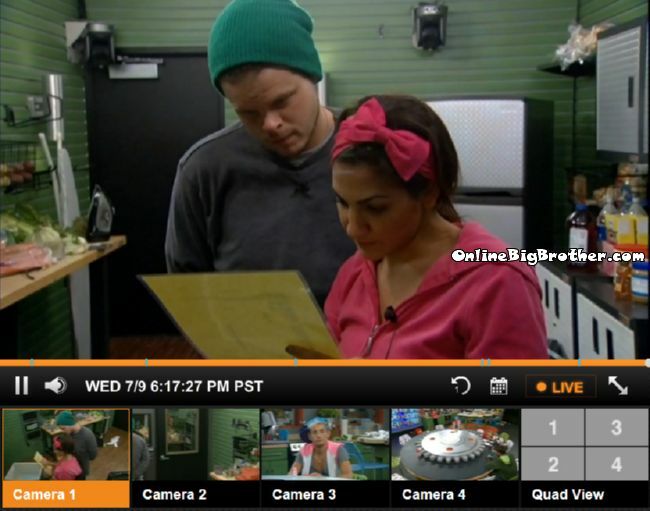 Frankie tells her Caleb and Devin won’t even look at each other during the activity tracker meeting. Brittany thinks Devin knows everyone wants him gone. Amber rolls in.. They chat about the house drama for a bit Brittany tells them it’s better for her game for Zach to stay because it leaves a BIG target in the house and takes the target off her. Christine asks her if she knows who she’s voting for. Christine says Donny is voting to keep POW because he wants to stay loyal to her. She tells him she doesn’t like Caleb the way he talks to her. Derrick says she was saying she likes him yesterday. Victoria likes him as a person she just doesn’t like him in the game. Derrick starts to explain what went down last night. Frankie went up and told Devin the house was voting to keep Zach. Devin panic and pulled Brittany and Donny up in to the HOH and start throwing everyone under the bus to flip the house back. Victoria wants to know why Frnakie would do that. Derrick tells her that Brittnay sold her soul to Devin Devin made a 180 on Brittnay in under 24 hours that’s never been done before. Victoria says she doesn’t trust Frankie anymore, Derrick doesn’t either, “I’m not talking to Devin at all I drew my line with him” Derrick tells her he’s taking Devin out next week. Victoria says she doesn’t trust anyone even Nicole and Christine. Derrick says if she has anything she can come to him. Derrick says the person that confirmed the 8 person alliance is working with Devin, “Was it a girl” Victoria won’t say. Derrick says there was an agreement no alliance. Does Derrick remind anybody else of Memphis (S10)? Donny is a much better player than they realize. Wasn’t this because Donny told Derrick and Derrick told Frankie? Maybe Donny just forgot he told him but perhaps Frankie started the conversation about it- I didn’t see the feeds so I am not sure. I’m entirely confused. Wasn’t it Donny himself telling everyone about Devin’s creepy bedside visit? OK, good, I’m not entirely losing track. Hey Simon/Dawg can you make a poll about who is going home? POW POW or Zach. Hahaha……funny Simon. I guess we should keep Dawg. Great job, you two. I’m actually growing into liking her “gameplay”. It’s in her best interest to rally and vote out Zach, this is the damage of Derick’s move to unite Caleb and Zach last night. (Derick really should’ve just let the votes of Amber, Caleb, Jocasta stay on Pao and try to soothe things over after the vote.) With Caleb and Zach back together, it does not take a mastermind to know that she’s their target. I’m actually hoping she’ll win next HOH to see if she’ll be manipulated or not, her angst show that she can potentially think on her own but recent actions also show that Derick and Devin can control her. What is it with people who think only superfans should qualify to be on BB? Get over it. What’s funny is that during Devin’s house meeting…Zach was the one who spoke up & questioned Devin’s nomination of Brittany…Zach wanted Brittany to stay…did any one bring that up? 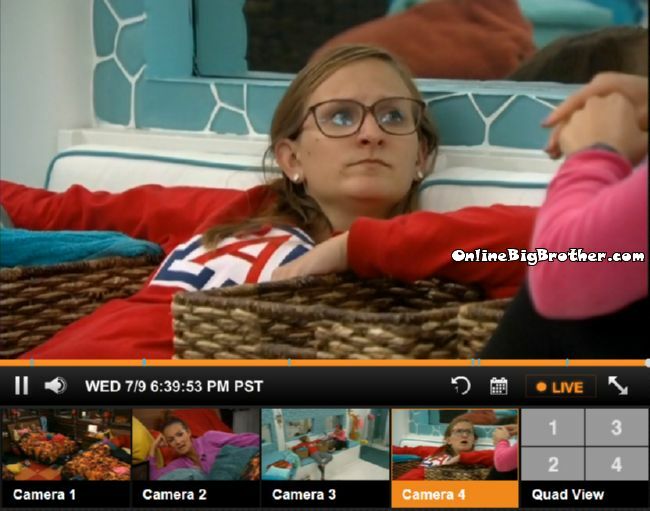 Now Brittany wants Zach gone…. I thought she was leaning toward keeping him. She does need sleep though. Every day someone I liked starts to annoy me. Yesterday it was Brittany and today it’s Derrick. I think this Team America thing has gotten to his head and now he’s non stop game mode and he needs to cool it. Do you have a favorite Simon? not really.. I’m liking them all right now. Frankie maybe the least but they all have great qualities. im getting sick and tired of Victoria always playing the victim when it comes to the guys in the house its getting annoying. also Derrick is all talk he wont put up Caleb/Devin if he’s HOH he’ll try and backdoor them so he doesn’t get blood on his hands if he put them up and they won BOB/POV he knows they’ll come after him. I swear Christine reminds me of Linda Belcher on Bob’s Burgers! Everytime I see her on BBAD that’s all I think about. Great job Simon and Dawg. YOu are are the real Bomb Squad not those crazy ones in the house. Tonight’s episode was hilarious. Pow cracked me up during the Veto ceremony. Instead of speaking to save herself, she was ‘modeling’. That was really funny. I also like how the TA members used the ‘secret’ words to identify themselves. Pow…..LOL. These people flip flop as much as out of the water fish, they act so bipolar! I like this one this hour and then turning on them the next hour. Lol Donny throwing the target on Caleb and getting the floaters to all get on the WE HATE CALEB train. Caleb is a straight shooter and a hell of a competitor, hey Donny you might want to get to know him, the kid has a really soft heart and the cockiness is just a front. Good grief though him aligning with Amber and Devin is really going to cost this guy in the end. Only ones I can actually stomach at this point is Derrick, CHristine and Hayden, the rest can GTFO. Do they know each other’s last names? Read that Frankie’s using his father’s last name and that he and Ariana are half brother/sister. They have the same mother—different fathers. And now she wants to vote him out,not cool Brittany,not cool. 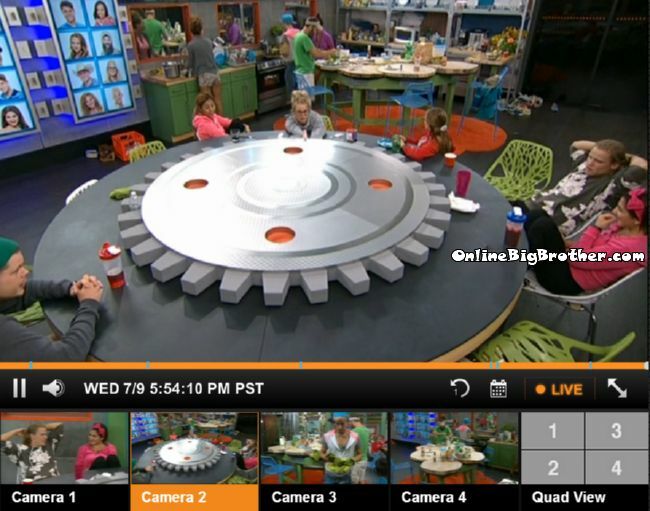 That’s what I said earlier…did Zach or anyone in that room during D’s “house meeting” bring that up? Grrr…why didn’t Christine say something when she was getting grilled by Don/Brit/Joc? Frankie really took a hit this week. Half of the house doesn’t trust him anymore. Black Fish is back!!! I thought KKKBarbie killed you last season. Glad I was wrong. IF Donnie could join TRILOGY (HayChrisNic) without telling Frankie or Derrick they could be F4. Guess Frankie is getting the golden edit this season. Apparently only the live feeders will now of his extreme douchery. I noticed that too, I believe producers will do everything they can to keep him in the game as long as they can. Wish Nicole got the America’s player over Frankie. Devin makes the best faces, there is no way he could bluff anyone. I feel bad for Devin even though he has a really bad game I don’t think anyone should be ostracized, and I truly feel like the reason he is staying away from people because he knows they don’t like him i mean who wants to be around when you know someone doesn’t like you no matter what the reason. Im not condoning how he speaks to some people but Zach did the same thing and everyone is cool with him (he only apologized to get votes I don’t believe he really means it) and the strong arm thing I’m over that excuse because thats exactly what all the other guys are doing to get people to vote how they want (but its called campaigning when they do it). What Brittany is doing trying to get Zach now is actually a good thing and if some of the others were smart they would do the same keeping Pow would actually help them because with Zach gone there would be one less strong person. So because they don’t like Devin (which is personal) they are going to mess up their game which is dumb IMO. I don’t like Devin, but I kind of feel bad for him too. Game aside, he just doesn’t seem to know how to successfully create (or maintain) a good interpersonal relationship. I think he just can’t pull it off with his particular personality challenges. Talking endlessly, he doesn’t seem to be able to take in what he’s getting from the other person. I think it’s the ADD, he does seem genuinely confused sometimes, like he can’t track what he’s hearing. Some kind of reception disorder…I dunno, but I am feeling sorry for him too, I honestly don’t think he can help it. It is sad to think Devin might see some of this stuff when he gets home…I personally don’t know how anybody desires to do these shows; I’m sure they don’t go in thinking a couple million people might REALLY dislike them. I don’t know if “some” actually have enough stability for the criticism. Hahaha…..you guys never cease to entertain me! Gotta agree with many of the other on here and thank Dawg and Simon for there great work. Sure looks like they had to edit out tons of this weeks events thus far and I wouldn’t habe known had it not been for this site. Despite the edits though, one of the most disappointing things was productions complete lack of knowledge of elementary astronomy. If you are putting groups of planets together you are not making a galaxy-put them around a star and make a solar system. You can’t make a galaxy out of planets. Or how about, instead of planets, make them stars and then it could at least resemble a galaxy more. Lets not let scientific education in this country fall further down the crapper than it already is. The veto comp was to make a BB galaxy out of planets. Planets make up solar systems, it’s stars make up galaxies. It’s literally 3rd or 4th grade science. We put the fitbit tracker in this episode to normalize voluntary tracking systems to the young impressionable minds. We worked with Facebook to change newsfeeds to monitor changes in moods to millions of unsuspecting users to guage changes in behavior. We use reality shows like BB to see how people react to voluntary lockup situations. Isn’t science exciting? Yeap, when I saw that. I was like wow they are really going all the way out to use them for an additional experiment. What ppl will do to win. So are you saying to hell with scientific education because it can be used for manipulation? Seems like an even better reason to me to promote it. Or am I just reading way to far into your statement and did it have nothing to do with mine? Either way, I have digressed- apologies.